Texas Rangers Cards: Royals and random stuff. 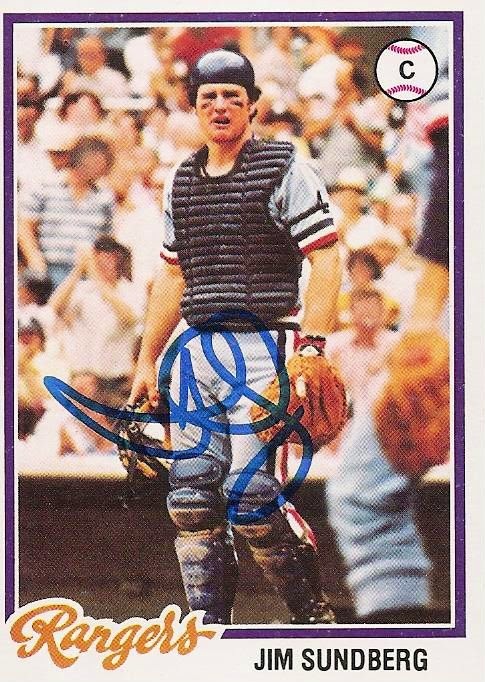 In recognition of the Royals win last night I am posting this signed 1978 Topps Jim Sundberg card. I got this card signed in person at the Rangers FanFest this past spring. Of course, Sunny was also the Royals starting backstop when they won it all in 1985. Hope to see another Royals championship this year as well. Since they didn't win game one the odds aren't with them. Odds don't seem to really bother this KC team though. Been doing a little work on the trade list over the past week. I now have team names listed in the misc, rookies, and minis categories. Some of the players I am sure everyone knows the teams for but I think it's easier for team collectors to scan for their team rather than for specific players. Also eliminated a player or two from the list. Some of the Pudge game-used are on hold for a possible trade but the rest of the list is still available. Take a look and let me know if you see anything you like. The off-season is rapidly approaching and a few trades would make the long winter a lot easier. Also, if you have a card blog yourself and would like it added to my links list, let me know. I'll take a look and see what I can do. I would like to add some more team oriented blogs in particular but any card blog is a good blog.